29 tows by 5 different tow pilots. Crazy busy would be a great way to describe Saturday April 6th. Dan had 2 new tow pilots to check out. Terry from Santa Barbara and Brian were both interested in getting checked out as part of our Tow Pilot membership program. Dan was working with them by 0900 to go over the procedures for towing. John Harbick and new member Kelsey Brown (I think) had already prepped Orange Crush and were staging to tow behind the checkout pilots. John dutifully performed as designated student pilot behind the towplane. The only problem I could see with his tows were that he was steady behind the towplane. A good indication that he'll be ready for his checkride as soon as he decides to schedule it. I brought out a new camera to test on Orange Crush. A GoPro like sports camera with a remote control was too good of a deal to pass up and might prove another revenue stream for the club. 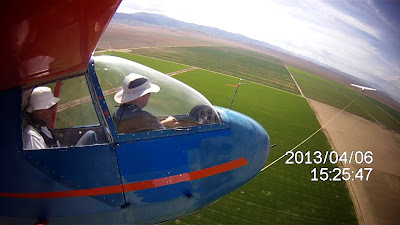 Videos of demo flights. Alternately, I may choose extortion as another revenue stream. Or at least we'll start recording flights and charging fees for not clearing turns. I suspect that this will be a very fun toy once we work out the use of the remote control and get a larger memory card. The Camera mounted just inboard of the dive brake. Julie took an early tow behind Brian, intending to just go do 3 pattern tows for currency requirements. Well, it was a little too good to just come down and she played around for at least a half an hour off tow. 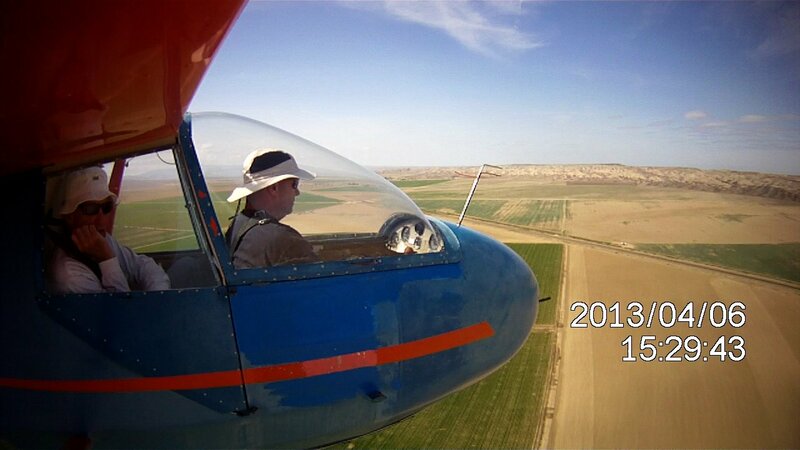 Darren Council continues to prep for his pending Solo in gliders. Several flights and simulated rope breaks with Harold were done in the morning. I don't think he soloed on Saturday, it may have just got a bit too turbulent with the good soaring conditions. Better to hold off on a solo flight until things are calmer. Darren Council on another prep flight before solo. Steve Schery took off in his Russia and headed to the mountains to hunt the convergence. Jeff Richardson and I took a tow around 1:30 when Julie took over towing duties. Nice clouds marked the convergence to the West and TG (Ramy) out of Hollister was already approaching Black Mtn by the time we were taking off. We easily climbed away and headed to Tar peak getting up there and diving across to the Avenal Hills and the first clouds. We ran the cloud street down to the Western edge of the California Valley and the La Panza Range near Pozo before the clouds ran out and we turned NW with TG. We ran NW towards San Miguel and had our eyes on some clouds to the West of Paso Robles. We were able to tip-toe across a hole between the two sets of clouds and the poke our way slowly to the west while trying to keep out of the Restricted Area and with Paso Airport remaining within glide. We did finally connect after some slow going and then enjoyed an easy run to the west end of Lake Nacimiento. We couldn't quite make it out to the coast or to Hearst Castle, but we were within 10 miles of Hearst. Looking SW towards the ocean from over Lake Nacimiento. We turned and headed back. Thankfully there were stepping stones to the South of Paso that made our crossing pretty easy. I tanked up just to stay on the safe side, but we had no trouble reaching the main convergence near Shandon. From there, Jeff flew the remainder of the flight trying to emulate what I'd been doing earlier with cloud reading and speeds to fly. Jeff takes us up the Cholame Hills in preparation to jump to the next cloud street. He did great for his first time in a Glass ship. He'd planned on getting checked out in the back seat of the 2-33, but instead got 1.5hrs of logged time in High Performance in the back seat of the Duo. One advantage to getting your license, you get to log the time you're flying the aircraft. We jumped back into the Avenal valley and flew around for a bit before landing shortly after Julie on her second glider flight of the day. While we were gone, the tows seemed to be rattling off at a crazy rate. Julie seemed to have operations running efficiently and we could hear her calling her patterns about every 6 minutes. During this time Harold was doing demos, training with Steve Kane, refreshing Jack Weigand and trying to learn the new spy cam. You can tell Steve is doing well by the fact that Harold is resting his chin on his hand. Of course, after a busy day like Saturday, he may have just been tired. I'm going to go with Steve is doing well. Dan worked with Kelsea on her glider rating and I believe they did several tows. Andy took another flight or two (at least I think I heard a radio call or two) and I'm not sure what else was going on, but it was a busy airport. Steve Smith filled in for Julie in the afternoon after he got back from his flight in NF and Julie was able to hop back in her glider for another 1.5hr flight back and forth between the mountains and the valley. Towards the end of the day, Steve Schery called in that he was at Coalinga and couldn't seem to get back to Avenal. He was able to stay up, just not get within a safe glide of Avenal. He eventually chose a safe landing at the Old Coalinga strip. The New Coalinga airport was being used as a Drag Strip and so he opted for the quieter choice of Old Coalinga. After breaking down our gliders, Julie and I took Steve his trailer and car and helped him break down in the dark. The Old Coalinga strip is in pretty rough shape now with fairly tall brush along the runway edges. 13meters of Russia fit just barely. 15m would probably work on the NW/SE runway, but if in doubt the fields besides the runway may be a better option. I wouldn't likely try to land the Duo on the runway there. After breaking down the plane Julie and I grabbed dinner at Harris Ranch and filled up 50gal of avgas from their pump since Coalinga was not working and headed for home. We didn't leave Avenal until 10:30pm. Long but fun and rewarding day.